Awesome place, great location, Fantastic staff willing to help with anything. Thanks! Take advantage of your stay to visit, stroll, meet... Taste a dish at any time in our brasserie, share a moment with us around a refreshment and a mignardise... Feel at home, better! Booking has rewarded La Villa Modigliani for the excellent experience experienced by customers throughout 2017. Congratulations to the entire hotel team! 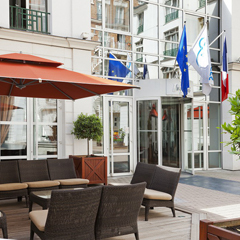 Just around the corner from the theatres of Rue de la Gaité in the Parisian artists' quarter of Montparnasse, this air-conditioned hotel offers an oasis of tranquillity amidst the hustle and bustle of the neighbourhood. Its understated elegance, peaceful courtyard and unexpected private garden come as a welcome surprise in the middle of Paris! The perfect place to stay when you visit the City of Lights. At the end of a busy day you can retreat to this peaceful haven in the 14th Arrondissement, or stop off for a relaxing teatime break to unwind before heading out again to have dinner or see a show in the evening. Free stay for the first child under 12 years old staying with 2 adults. Want to discover Paris differently? We propose you a selection of short stays from 144€ with unusual excursions included! Discover our program. Ideal to discover Paris or to make a stopover seminar, the Villa Modigliani is a haven of tranquillity in the heart of the capital. And, rare pearl: taste the calm of the inner patio with its fountain and the serenity of the garden to recharge your batteries or lunch in the shade of a Japanese Apple tree. Private covered car park (costs €180/night) with direct access. You're welcome to reserve a parking space before your arrival. Organize your congresses, meetings and receptions in our hotel, close to all the cultural sites and unavoidable city of light. 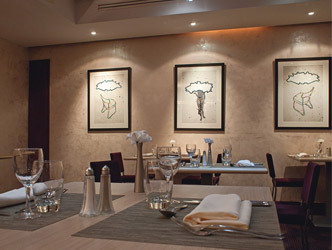 A Hotel with "Art Included"
In keeping with Vacances Bleues' deep commitment to promoting art, three-star hotel La Villa Modigliani hosts a permanent exhibition of artist Piotr Klemensiewicz's work. 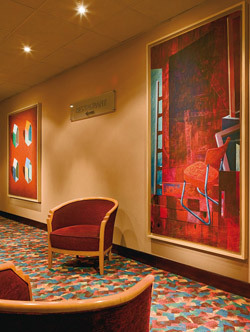 Around forty paintings, drawings and silkscreen prints are displayed at the hotel, making this the largest permanent exhibition devoted to Klemensiewicz. 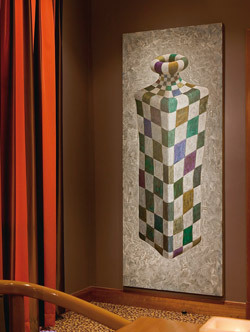 The artist works with familiar objects that still take us by surprise, and the singular universe he draws us into is totally in tune with the artistic mood of Montparnasse – bringing an added dimension to the cultural experience of your stay in Paris. Inspired by traditional Parisian architecture, the Villa Modigliani seduces with its elegance in the Montparnasse des artistes, a stone's throw from the Luxembourg garden and St Germain des Près! Relax during your family holidays in Paris thanks to its spacious rooms, sheltered from the hustle and bustle of Paris. Quiet, relaxing and quiet, in the heart of Paris! Charming hotel, air-conditioned and quiet, with private garden that offers a real haven of peace and an inner courtyard set back from the street. An unusual and atypical place, unexpected in the center of Paris! With 101 rooms – most of them overlooking the garden – Montparnasse hotel La Villa Modigliani offers quality accommodation for family holidays, romantic breaks or holidays with friends. The hotel rooms feature modern conveniences and can sleep from 1 to 4 people* (2 adults and 2 children). * Quadruple rooms are for families and have one double bed and one bunk bed. During your stay in Paris, make time to enjoy a delicious breakfast served as a buffet at our Montparnasse hotel in the 14th Arrondissement. Opening hours: from 10 a.m. to 9 p.m. Discover our short stay packages with visit! On weekends 3 days/2 nights + 1 visit of your choice*. Short stay 5 days/4 nights + 1 visit of your choice*. Discover our program. *With surcharge. La Villa Modigliani is located in the Montparnasse neighbourhood right in the heart of Paris, within easy access of public transport connections to take you all over the city. Without going very far from the hotel you'll find lots to do within the vibrant quarter of Paris' 14th Arrondissement. Montparnasse hotel La Villa Modigliani is located in the very chic Rive Gauche area of Paris, close to the Tour Montparnasse. Its ideal location means getting there couldn't be easier – no matter where you're travelling from. Air France run a shuttle bus from Orly airport to Montparnasse, and if you arrive by metro the nearest stations are Vavin and Edgar Quinet. Once you've settled into the hotel, you can go exploring the neighbourhood of Montparnasse, which is the 14th Arrondissement of Paris. The Paris quartier of Montparnasse is the traditional hangout of the city's artists, although it is now also known for the Montparnasse Tower – the only skyscraper in Paris – which you can visit for its breathtaking 360° view over the capital. Although this neighbourhood in Paris' 14th Arrondissement first gained its reputation back in the glory days of the Belle Epoque, it's just as vibrant and exciting as it ever was and still remains a favourite haunt of many artists. Take a stroll around its lively daytime streets and enjoy the sparkling nightlife in the many bars, theatres and cinemas. In your comfortable three-star hotel, you're only moments away from the luxurious boutiques of Rue de Rennes, the excitement of the Rue de la Gaité, St Germain des Prés and the Latin Quarter! Paris has everything you could wish for! Which is why La Villa Modigliani helps you make the most of your stay by providing our information service the Kiosk. From its best-known sites to its best-kept secrets, Paris is bursting with fascinating places to go and things to do. At the Kiosk you'll find all the information you need about the various tourist and cultural attractions in and around Paris. Our team are on hand to help guide you and ensure you don't miss out on anything you're interested in. Away from these celebrated destinations, Paris and the 14th Arrondissement are full of lesser-known places of interest with a charm of their own. Don't hesitate to ask the hospitality team at La Villa Modigliani for advice on the best things to do around Montparnasse. Modern architectures: Bercy, Centre Pompidou, Bibliothèque Mitterand, Musée du Quai Branly, Louis Vuitton Foundation..
Paris can be visited on foot, you have to look up, admire the facades of the buildings, visit the museums, the catacombs, do not hesitate to take the time to sit down on the terrace of a café and watch life go by for a few moments. There's always lots going on in the capital, no matter what the season. Summer brings the Musical Fountains Shows at Versailles, October sees the Salon du Chocolat, and there are seasonal sales in the big department stores. January sees the big department stores hold their sales! If you're looking for a Paris hotel in the heart of the city's grand leisurely boulevards, look no further than our Hotel Provinces Opéra. Access to Rue Delambre is from the Boulevard du Montparnasse. We are able to arrange air travel for you at attractive rates. Vavin station (line 4) or Edgar Quinet station (line 6). Seven days a week, 24 hours a day. Arrivals: rooms are available from 3 p.m. Please let La Villa Modigliani know in advance if you will be arriving late. If you haven't arrived by 10 p.m. and we haven't heard from you, we reserve the right to reallocate your room. FORMULE NIGHT + BREAKFAST: Accommodation and breakfast. Double room in single occupancy: 102 to 125€/night. FREE stay for the first child under 12 years of age staying with 2 adults. Starting price from 54€/ pers. Close to the city center, Hotel & Spa Le Splendid de Dax is ideal for enjoying the city's festivities all year round. A delight for all lovers of history and culture.